Sting.com > News > New Auction Package To Benefit The Sweet Relief Musicians Fund Featuring A Guitar Signed By Sting! 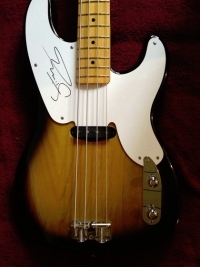 Bid on a Fender Sting Signature Series Precision Bass guitar signed by Sting to benefit the Sweet Relief Musicians Fund, which provides financial assistance to career musicians who are struggling to make ends meet while facing illness, disability, or other health-related issues. The 1950s-style Bass features a vintage-style single-coil pickup, contoured body with 2-color Sunburst finish and Sting's signature in the block pearl inlay at the 12th fret. Please visit http://chrty.bz/NcgCMz to place your bid!